Sigma has established themselves as not just a second choice lens, but a provider of different lens types to fit all occasions. The three main categories of Sigma lenses include ‘Contemporary’ for standard zooms, ‘Sports’ for telephoto lenses, and ‘Art’ for the top end of optics covering fast prime lenses, macros, and wide angles. The 35mm f/1.4 DG HSM is from the Art category and is aimed at being equal in quality to your own brand equivalents and at a cheaper price. The Sigma was tested on Canon mounts and specifically the 5D Mark IV and 7D Mark II cameras. This was specifically to get an idea of its image quality on both a full-frame and crop sensor camera. 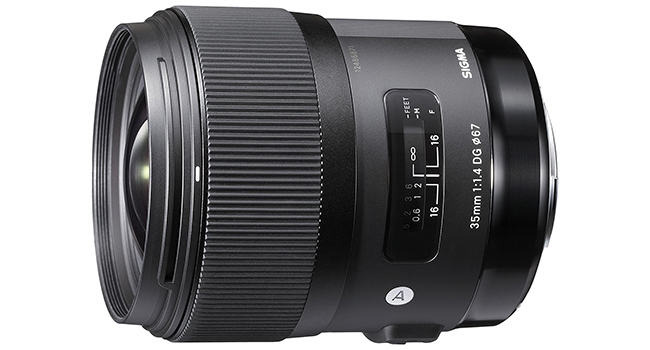 Don’t think Sigma have skimped on their design to bring a cheaper lens to the market. There’s a lot of quality glass in this lens comprising of 13 elements in 11 groups, with four elements made from Super-Low Dispersion (SLD) glass, one element being fluorite-like ‘F’ Low Dispersion (FLD) glass and two aspherical elements. All these elements are there to cut down on chromatic aberration and distortion. The lens itself has an all-metal barrel and looks and feels extremely solid and functional. Autofocusing is done via Sigma’s ultrasonic-like HyperSonic motor, which works just like its rivals to be quiet and fast and also has a manual override. An auto/manual focus switch is found on the side of the lens for engaging the manual focusing. The large front manual focus ring is large enough to get a good grip and turns very smoothly. The internal aperture diaphragm has nine curved blades and the lens itself features a Super Multi-Layer coating to reduce lens flare. The filter thread is 66 mm and does not rotate when focusing. Lots of quality stuff here. The focal length of the Sigma is 35 mm or 56mm on a crop sensor, meaning on a full-frame sensor you get quite wide-angle views and on crop sensors just over the standard of 50mm. Wide open is f/1.4 down to f/16 and 0.3m is the closest focus point. The whole lens itself weighs in at 665g(23.5 oz), being a heavyweight of all the 35mm lens out there and physically the longest. The only real negative would be that it’s not weather sealed like some of its equivalents. If you want image quality and build to be as good as the rest and also be more cost-effective, something has to give and I’m guessing it’s with the weather sealing. Straightaway there are caveats when discussing the performance of the Sigma lens as it will really depend on the camera body it is being used on and the mode. Being quite a chunky lens, it will be more at home on a full-frame body, but it’s not overly heavy on a crop sensor body. The lens drops in performance being slowed down in focusing when you’re in live view. Being a 35mm lens, close-up shots are not its forte, but wide-angle scenic images look fantastic. Starting with f/1.4 the center of an image is quite sharp but becomes its best at f/2.8. Once you start getting to f/5.6 with a properly calibrated camera, you’re getting as sharp as competitor lenses. When it comes to chromatic aberration you will find more on a crop sensor body, but this can be easily rectified in post-processing. If you have a Nikon DSLR, then internal JPEG processing can handle this issue. Otherwise, it’s quite acceptable across the board. What you do get on full-frame sensor bodies is more distortion and vignetting, but no more than you would find on a competitor’s lens. Again, you can rectify this in post-processing, so no worries there, but this is down to taste. The lens handles flare quite well, not suffering from the type of reflections you’d normally associate with a prime lens with loads of internal glass like this one. Having f/1.4 at your disposal means you hope for a very pleasing bokeh/background blur in most situations. The lens does this very well, but keep your backgrounds simple which will help to smooth out things. In other words, if you want more pleasing, creamy background, then keep things plain with few details. On both the Canon 5D and 7D the lens exchanged information with the camera seamlessly, as you would expect if you used a default Canon lens. It may not have some of the ‘je ne sais quoi‘ of a Canon lens or really the image quality, but it’s very close. If its just pure image quality your after, then you will go with the standard Canon lens, but if you’re on a budget the Sigma is a tempting option. You cannot really discuss Sigma lenses without some sort of comparison to camera brand equivalents. Price is a big consideration, but so is image quality from the cheapest to the most expensive lens. The Sigma’s competition is the Canon EF 35mm f/1.4L USM, a great lens, with the Sigma keeping up in image quality. As far as image quality goes the Sigma is a sharp and fast as the rest, proving to be just as adaptable on a full-frame or crop sensor body. I have to admit, it used to be that Sigma lenses were usually the second choice to a camera brand lens. In many ways as a cheaper second option due to budget. Those days are now behind us and the Sigma 35mm f/1.4 has image quality nearly as good as a Canon equivalent. If you take into account things like chromatic aberration, distortion and vignetting, it’s as good or better as anything else in its class and image quality throughout the range is just as good or better. The only real downside is complex backgrounds which can sometimes not look as pleasing with bokeh. This can be very subjective and really depends on your subject matter. The build of the lens is very solid, with the manual focusing ring very slick and precise. The only real downside or reason not to buy here is the lack of weatherproofing or if you’re hellbent on having image stabilization on all your lenses. In total, the Sigma 35mm f/1.4 DG HSM does a great balancing act of being as good or better than the rest in image quality and also at a better price. If you want a fast prime lens which is one of the best in its class, it should work very well on your chosen camera body and at a very competitive price. If your decision-making is based purely on price, then this is a no-brainer.